The hukamnama sahib today is in the dhanaasree ragini and it is connected with an event in Bhagat Kabeer Sahibjee's life. Bhagat kabeer sahibjee used to live in the city of Kansi and one day Bhagat Kabeer Sahibjee picked up all their things and they moved to the very barren city of Maghar. The history behind this is, it is said that those people who die in Kanshi, Shivjee - one of the Hindu demi-Gods has given blessing that anyone who dies in Kanshi he will liberate them upon their death. It is said that when Shivjee made this city of Kanshi, according to the mythology it is dedicated to Shivjee, that Viaasmuni came and started teaching in the nearby Maghar. When Shivjee saw that people were moving from Kanshi to Maghar, Shivjee was upset and he sent his son Ganesh and said, go and change this around for me somehow. I want all the people to come back from Maghar to Kanshi. That jan - that humble servant, that humble being who even knows little, kash jaanai mean to know even a little bit, bhaao means true love and bhagath - devotional worship. Bhagat Kabeer Sahibjee is saying that even if someone only knows a little bit thaa ko acharaj kaaho - why should that person be surprised at what I am doing? There are no surprises in this. There is no reason to be upset, there is no reason to be alarmed, bhagat Kabeer Sahibjee is says. Even if you understand a little bit of the true love for the lord you'll understand what I am about to say to you. Thaa ko acharaj kaaho - do not be alarmed, do not be surprised, do not be frightened. Like when the water in a earthen pot, when that earthen pot breaks and the water falls back into the ocean jal jal mehi pais n nikasai - the pais again cannot be nikasai - cannot be taken out, cannot be separated again, like water cannot be separated from water. Once the water of the earthen pot is merged into the ocean again, can it be separated? No, never! Thio tur miliou julaaho - in the same way I've melted into, Bhagat Kabeer Sahibjee uses the word julaaho here which means weaver which was the craft which Kabeerjee used to do. This weaver has melted into, has merged into that Waheguru. jio jal jal mehi pais n nikasai - now I cannot be nikasai - nothing can be separated. Once you gain union with the lord that is eternal mukhti. Bhagat Kabeer Sahibjee is telling us it doesn't matter where that jivan mukhat - liberated whilst being alive, goes he is eternally liberated and eternally united and no one can break that union with the lord. Thio tur miliou julaaho - in this way I have merged into, melted into julaaho; ju means that thing and laaho meaning which gives me profit - into the name of the lord. 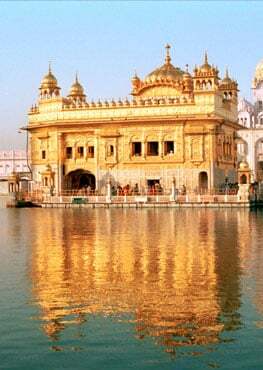 Guru Teg Bahadur jee explains this in their bani: naanak leen bhaeiou gobindh sio jio paanee sang paanee - like water merges into water so the souls of the god conscious being merge into the lord. If Kabeera was to thajehi - was to give up my than - give up physical body in Kanshi then what will be the nihoraa - the task there? What would be the grace of Waheguru? What Bhagat Kabeer Sahibjee is saying is that I am here in Maghar to show the greatness of God's name, to show the world the greatness of the name of Waheguru. Each step that Bhagat's take - those god devoted beings, bhagats who are devoted to the lord - each step that they take is always devoted to showing the glory of the naam - the glory of the name of the lord. Bhagat Kabeer sahibjee is saying that I am not settling for a liberation of dying and going to Shivpuri - to the city of Shiva - no I don't want that. Whilst being alive I've merged into Waheguru, into that god. Rehaao - Bhagat Kabeer Sahibjee says think about this. Bhagat Kabeer Sahibjee is saying listen loee - O my wife, Mata Loee jee and rae loee - O people of the world kehath kabeer sunahu rae loee - listen O people of the world, bharam n bhoolahu koee - let no one be deluded in doubt, not even one person. Bhagat jee is saying get out of these bharams, get out of these delusions, these doubts, and cast them off. All of these delusions, all of these doubts take all of them out of your mind. This is why I am doing this - to take out the bharam - to take out all of your doubts, to make you cast them aside. - Raam naam - that person who has the name of lord, of raam, our means in their heart, gaheo means grasped hold of, the one who has grasped hold of the name of the lord within their heart jaa kais am nahee koe - there is no other who is sam - who is equal to that. jih simarath sankatt mittai dharas thuhaaro hoe - by meditating upon Waheguru all troubles are taken away and they are blessed with the vision of, merge into the complete eternal being, Guru Teg Bahadur jee says. In the same way Kabeer jee is saying, raam ridhai jo hoee - if that person has Waheguru within their heart then there is no difference. The gurmukh piaare wherever they go, wherever they step; another interpretation of this shabad: whether they go into sadness, happiness, places and times in their life where people see them as being in pain and happiness, it doesn't matter wherever they go they have Waheguru in their heart at all times, Bhagat Kabeerjee says, it doesn't matter where they go they will always be liberated. That is why Bhagat Kabeer sahibjee did this kautak - played out this play in their life to show the world that it doesn't matter, that the name of the lord cuts through everything, that the name of the lord will save us and liberate us no matter what.